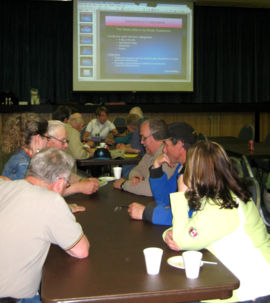 Formed in 2002, West Central Stakeholders is multi-stakeholder synergy group in the Clearwater County/Rocky Mountain House area. Participants include community members, the Alberta Energy Regulator (AER), oil and gas companies, local schools, the Town of Rocky Mountain House, Clearwater County and Alberta Agriculture & Forestry. Membership is open to any interested community resident or oil and gas company active in Clearwater County. There is no fee for community participants. Contact us to learn how you can become involved. A lasting relationship based on trust, honesty and respect by way of mutual education, sharing information and assisting in resolution of issues to benefit members of the community: public, oil and gas industry and government.